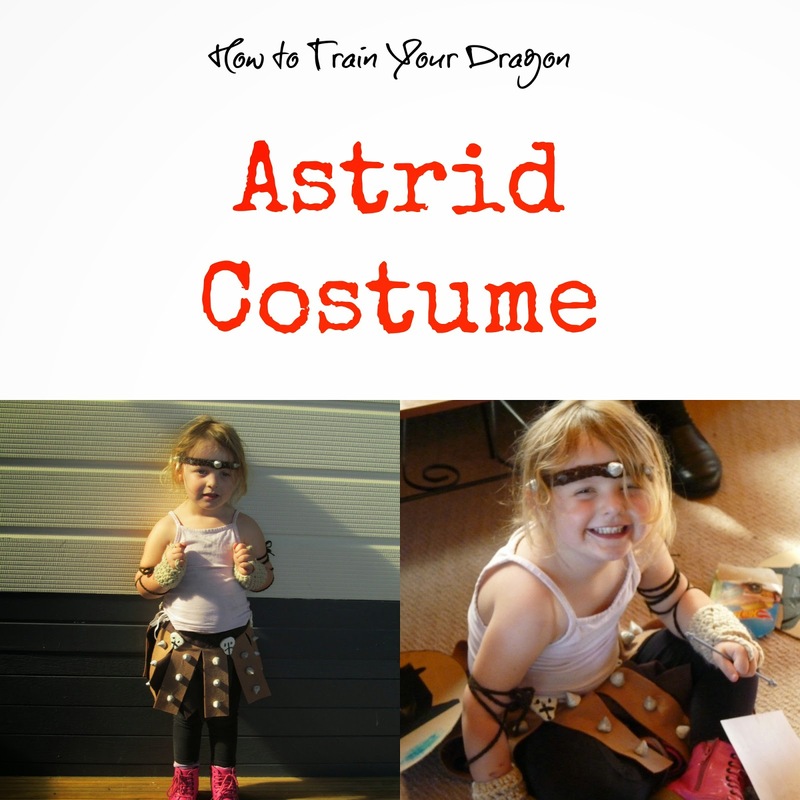 So when each child was asked if they wanted to be a Viking or a Dragon, my little girl decided to be Astrid. Thanks love, more work for me. Actually it was quite quick and easy to make. 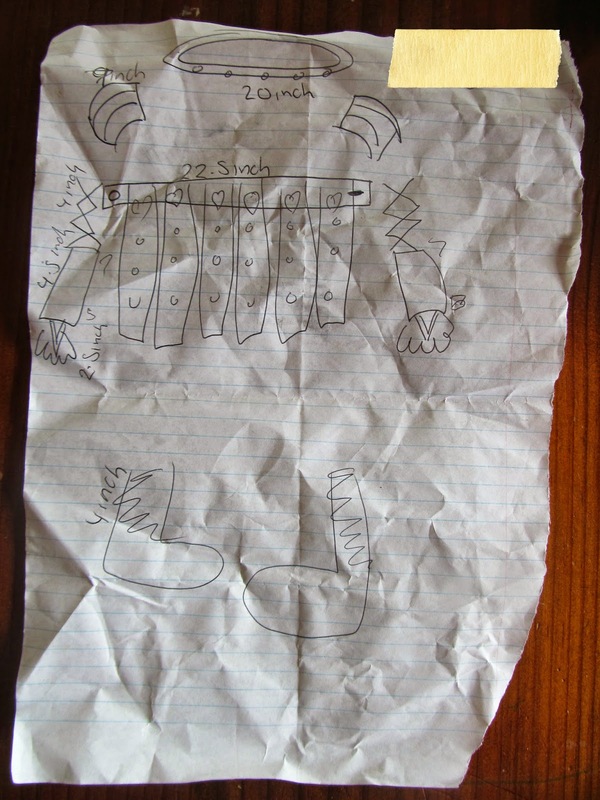 First I did a sketch of the parts we wanted to make, did I mention I can't draw? Then I took measurements. Here is a basic overview on how I made each part. This is crochet, if you can crochet you could just use a band of brown fabric and add spikes. You will need brown yarn, a crochet hook suitable for the yarn, yarn needle and scissors. Chain the amount you need to go around the head, or to head measurement. Join to first chain with a slip stitch. Ch 3, dc in each stitch around. Join to top of ch 3 with a sl st. Finish off and weave in your tails. Once again you will need to know how to crochet for these. Light brown yarn, I used 12 ply. Gauge: 5 stitches x 5 rows in 2 inches done in sc. Ch 14, skip 7 sts, sl st into next st to join. Finish off and weave in ends. To make the arm straps, join brown yarn in stitch directly below your finger loops stitches. You want to make two chain straps for each glove. I made my chains 20 inches long. Spikes: These are made with salt dough, you could use polymer clay but this was a quick solution. I used this recipe: http://rainydaymum.co.uk/the-quickest-ever-salt-dough-recipe. When they cooled down I painted them with silver paint. 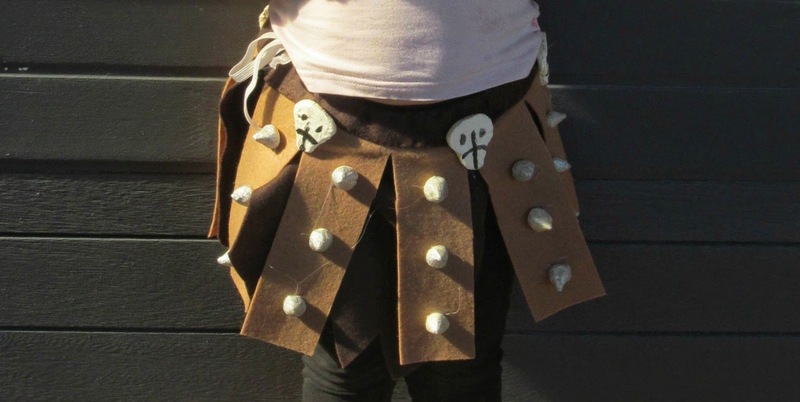 I used 4 small spikes and 1 large spike for the headband, 20 small spikes for the shoulder armor, 15 large spikes for the skirt. Skulls: I used the same recipe above to make the skulls. I just rolled out the salt dough and cut the shapes out the best I could and then painted on the details with black paint. I would love to blame the rum for these but really I am just not very good at anything other than needle crafts. Armor: I actually used a cereal box to make these. I cut 8, 10 inch strips out of the cardboard then painted them silver. Once they were dry I used pegs to hold them in place and stitched the ends. I used the thick needle and thread for this. Once this was done I used hot glue to stick the spikes and skulls to the armor. There are no pictures of her wearing the armor because once we pinned them to her outfit she decided she didn't like it. That's 3 year olds for you. Step 1: Measure the child's waist and lay your three pieces of felt out. Mine are slightly overlapped. If your child is larger you may need to add another piece. Step 2: Lay your light brown pieces on top as shown. Step 3: Lay your elastic on the top of the light brown. Step 4: Fold the dark brown over to create a tube for the elastic. Pin down and stitch closed. Step 5: Cut the light brown into strips. Cut triangles out of the bottom of the dark brown. Step 6: Glue on the spikes and the skulls. I only stuck them to the front of the skirt so it wasn't uncomfortable for her to sit down.